This is the solid green color variant of 'L. . Native to Assam, in northeastern India as well as Nepal from which the name L. nepalense comes. Unlike the var. robustum which is quite tender, var. concolor has proven to be quite robust. In his book 'A Guide For Growers and Collectors' by Edward MrRae, he reports "Several magnificent plantings of this strong growing variety were observed in Aurstrlia and New Zealand in 1997". Title photo copyright Bleddyn & Sue Wynn-Jones, all rights reserved. Found located in Nepal at about 9,000 feet (2,785 meters). Used with permission. Bleddyn and Sue Wynn-Jones own and operate Cr�g Farm Plants in the United Kindgom. Their web site can be found at http://www.crug-farm.co.uk and there you will find a wonderful selection of lilium species ranging from the more common to the most rare. Insert photo courtesy of Dr. Markus Hohennegar PhD. 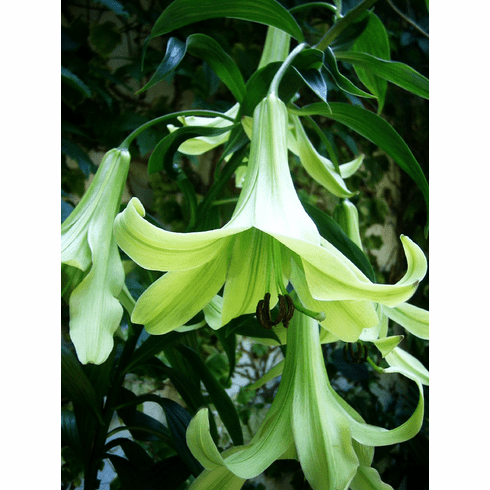 @ www.the-genus-lilium.com and comes from Ganesh Mani Pradham & Son, a nursery in NE India who offers a wonderful array of Aroids, rare bulbs, Gingers, as well as a nice selection of things you are not going to find at any other nursery. They are members of the Association of Plant Exporters of Kalimpong (APEK). Their web address is www.ganeshvilla.com.